List of Articles Indonesian Travel Show Features Marikina, Shoe Capital of Phils. Indonesian Travel Show Features Marikina, Shoe Capital of Phils. A team from an Indonesian travel show is so impressed with the uniqueness, cleanliness and overall beauty of Marikina City that it has decided to do one episode (published in three parts, see video links below) about the famous Shoe Capital of the Philippines. “Actually, when we came here we want to do four episodes about the Philippines. 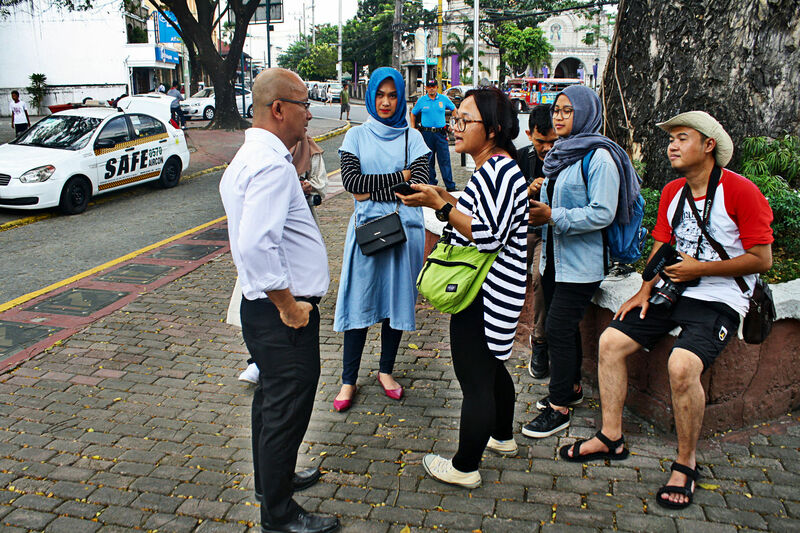 But when we visited Marikina, we decided to add one more episode that’s all about Marikina,” says Novianti Endaryati, producer of the show titled Hijab Traveling at Trans7 in Indonesia. “We are very impressed at how clean Marikina is, its streets, the river bank. When I searched about the history of Marikina in the website, I found out that it’s the shoe capital of the Philippines. That’s very unique. In Indonesia, there is no place that’s the capital of anything. Marikina food is also unique and can’t be found in other places in the Philippines such as Everlasting and Waknatoy,” Novianti adds. The seven-man team from Halal TV, including its host Indah Nada Puspita, will do a 45-minute episode on Marikina called “City of Shoes” featuring the Shoe Museum, the city’s shoe manufacturers, Pan de Amerikana restaurant, which served Everlasting, Waknatoy and Halo-halo to the team when they visited the place, as well as the Marikina River Bank. Aside from Marikina, the travel show will also feature Intramuros, which it billed as Little Spain of Asia, Malacanang Palace, the Muslim Community in Manila, as well as the country’s diverse Food Scene, Novianti says. “When I came here (in Marikina), I said, “Wow!” as if I am in another country. It’s very clean. The City Hall has all the information that tourists need about the city, where to go, what to eat, the history of Marikina,” she adds. Hijab Traveling is interested about the Philippines, and Marikina in particular, noting that most Indonesians are not familiar about the other places in the country other than Manila and Palawan. The show’s host, Indah Nada, is a fashion designer and a social media influencer in Indonesia and is also popular in Malaysia, says Novianti. She is hoping that after the episodes aired on Indonesian TV, more Indonesians and even Malaysians would visit Marikina when they come to the Philippines.